Description: Theemim are around three feet tall. They’re super strong and build like the trunks of trees. They have bright silver skin and wear gold and purple jerseys. They are all bald, but they do have bushy purple eyebrows. They have three spider-like legs, which makes them skate in a zig-zag pattern. Culture: Theemim society is built around a huge monarchy. They have a very complicated setup of kings, queens, and other royalty. Every Theemim planet has exactly nine kings, who argue on nearly every decision their people make. Scouting Report: The Theemim are the slowest species in the tournament. But they make up for this with strength, they’re nearly impossible to knock down. 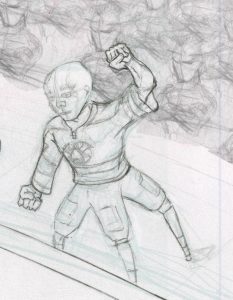 There isn’t a goalie in the universe who isn’t afraid of a Theemim winding up for a slap shot. A Theemim can dig their three legs into the ice, turning themselves into a tripod. This lets them launch pucks like rockets. 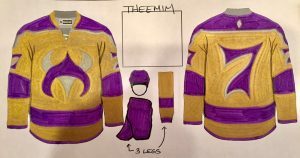 Fun Fact: It took the Theemim almost a year to decide on the colors in their logo!